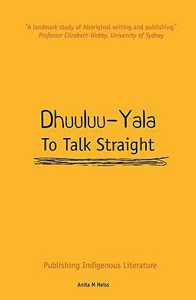 Dhuuluu-Yala is a Wiradjuri phrase meaning ‘to talk straight’ and this book is straight talk about publishing Indigenous literature in Australia. It also includes broader issues that writers need to consider: engaging with readers and reviewers. The book covers the period up to the mid-1900s, though some references are included up to 2000. Changes have been made since that date, however the issues identified in Dhuuluu-Yala remain current and to a large extent unresolved. The history of defining Aboriginality in Australia and the experience of ‘being Aboriginal’ have both impacted on the production of Aboriginal writing today. These twin themes are the major focus of the book. The pioneering roles of Aboriginal writers who have gone before and created a space has allowed for the growth of an Indigenous publishing industry. Indeed, a literary and publishing culture have developed also because of the increasing desire and need for an authentic Indigenous voice in Australian literature. Although funding and other mechanisms are in place and possibilities afforded Indigenous writers have improved, opportunities are still limited, leading to some authors choosing to self-publish. Dr Anita Heiss is the author of non-fiction, historical fiction, commercial women’s fiction, poetry, social commentary and travel articles. She is a regular guest at writers’ festivals and travels internationally performing her work and lecturing on Indigenous literature. She is an Indigenous Literacy Day Ambassador and a proud member of the Wiradjuri nation of central NSW. Anita is a role model for the National Aboriginal Sporting Chance Academy and an Advocate for the National Centre of Indigenous Excellence. She is an Adjunct Professor with Jumbunna Indigenous House of Learning, UTS and currently divides her time between writing, public speaking, MCing, and being a ‘creative disruptor’. Anita was a finalist in the 2012 Human Rights Awards and the 2013 Australian of the Year Awards. She lives in Sydney.